The design team at People People based in Stockholm Sweden, have designed a very unique wireless speaker in the form of the Small Transparent Speaker, which as the name suggests allows you to see its inner workings. 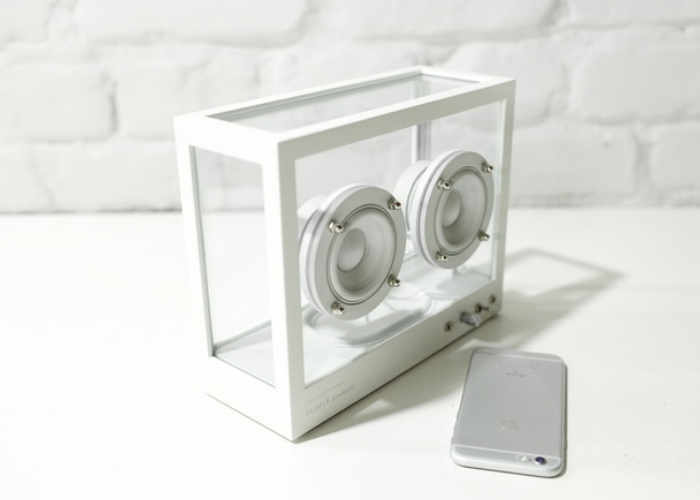 The wireless peaker has been designed to look great in any situation or environment and is constructed using a white powder coated aluminium unibody frame. The teams explains they have “worked tirelessly on every single detail to ensure aesthetic perfection” of the speaker before launch. Check out the promotional video below to learn more about the wireless speakers features, functionality and unique design. The design team at People People explain a little more about the speakers detailing and connections. On the front, you have a volume adjustment knob, a classic rocker switch for power on and off, a LED to show you if the speaker is on and a 3.5 jack if you prefer to use the included cable for your audio source. We have got you covered with the latest technology. The speaker has both WiFi and Bluetooth. This means you can easily send high-end audio from your phone, tablet, or computer from near or far in your house. We made a big effort to support both the latest and greatest platforms, such as Apple Airplay and Google Cast, to maximize your connectivity options. With wireless connectivity, we can update your product software so that the product improves over time. The first functionality that we are planning to launch is Spotify Connect which means that you can find our speaker super easily in the Spotify app. Our goal is to make the connected experience as friction free as possible for you. The Transparent Speaker is built with premium audio components. The two-custom made 2.5 inch full range drivers deliver crisp lifelike vocals, while the passive bass radiator gives a punch to any beat. It has a built-in amplifier which has embedded digital signal processing (DSP) to ensure a full and balanced crystal clear sound. If you use a high resolution audio streaming source, you will really start to hear new things. This product builds on all that we have learned from tuning the highly appreciated sound in our large Transparent Speaker. The Small Transparent Speaker is designed to last a long time. Even though it might seem unusual and counterintuitive to talk about scenarios of product failure now when the product is brand new, we believe that is exactly what we need to do. By considering potential ways the product might break, and designing the product to outsmart the landfill in these cases, we can make a big difference. The speaker is made out of materials that can be recycled to the same high quality over and over – this is called upcycling – and it is designed to allow for complete disassembly. The Small Transparent Wireless Speaker is now available to back via Kickstarter with pledges starting from $200 and shipping expected to take place during June 2017. Follow the link below for full specifications and more details.